Be prepared for any situation with the Multi Tools with LED light. No hunter, angler or camper should leave home for an adventure without their Multi Tools with LED light Utility pocket knife. 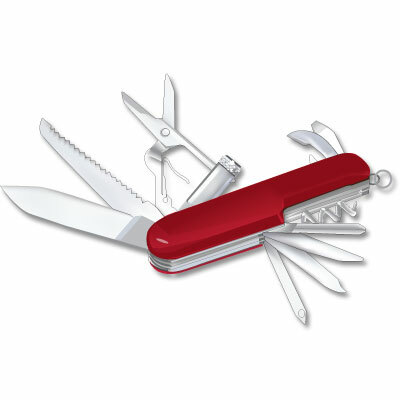 This lightweight durable Multi Tools pocket knife fits easily in the palm of your hand. For quick and easy fixes around the house when you need to use a corkscrew, screwdriver, or another tool to make a quick repair the Multi Tools with LED Light will do. It's easy operation and durable material is a great option for the picnic, camping, or for computer repairs.. Compact design easily fits into pockets. Includes 11 basic tools to be ready for nearly any situation while on the go. Weatherproof, Shock Resistant, with a Utility Carabiner Hook. A perfect gift idea for use in the outdoors or around the house.